"Snowy heron" redirects here. For the 1958 Japanese film, see The Snowy Heron. The snowy egret (Egretta thula) is a small white heron. The genus name comes from the Provençal French for the little egret aigrette, a diminutive of aigron, "heron". The species name thula is the Araucano for the Black-necked Swan, applied to this species in error by Chilean naturalist Juan Ignacio Molina in 1782. 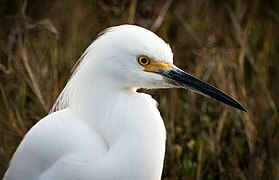 The snowy egret is the American counterpart to the very similar Old World little egret, which has established a foothold in the Bahamas. At one time, the beautiful plumes of the snowy egret were in great demand by market hunters as decorations for women's hats. This reduced the population of the species to dangerously low levels. Now protected in the United States by law, under the Migratory Bird Treaty Act, this bird's population has rebounded. 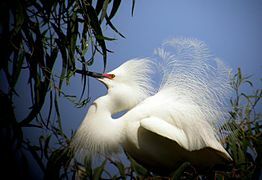 Snowy egrets nest in colonies on thick vegetation in isolated places, such as barrier islands, dredge-spoil islands, salt marsh islands, swamps, and marshes. Their clutch size is between two to six eggs. They often change location from year to year. During the breeding season, snowy egrets feed in estuaries, saltmarshes, tidal channels, shallow bays, and mangroves. They winter in mangroves, saltwater lagoons, freshwater swamps, grassy ponds, and temporary pools, and forage on beaches, shallow reefs, and wet fields. Snowy egrets are permanent residents in most of South America and Central America. In the United States, they are often permanent residents along the Atlantic coast north to Virginia Beach, Virginia, along the Gulf Coast, and along the Pacific lowlands from central California southward. During the breeding season, snowy egrets wander north along the Atlantic flyway between the lower Chesapeake Bay and coastal Rhode Island, and up the Pacific Coast to northern California. Snowy egrets also breed in the lower Mississippi Valley westward into eastern Texas. Birds banded in United States have been recovered as far away as Panama and Trinidad. Snowy egret has occurred as a vagrant in Europe in Iceland, Scotland and the Azores. Ponce Inlet Beach, Florida, United States. A snowy egret and its hatchlings in St. Augustine, FL. ^ BirdLife International (2012). "Egretta thula". IUCN Red List of Threatened Species. Version 2013.2. International Union for Conservation of Nature. Retrieved 26 November 2013. ^ Jobling, James A (2010). The Helm Dictionary of Scientific Bird Names. London: Christopher Helm. pp. 143, 385. ISBN 978-1-4081-2501-4. 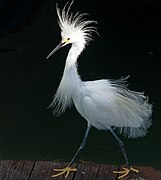 ^ a b "Snowy Egret: Life History". All About Birds. TheCornellLab. Retrieved 29 March 2019. ^ "Twitchers flock to see UK's first snowy egret". The Scotsman. Retrieved 25 December 2018. Wikimedia Commons has media related to Egretta thula. 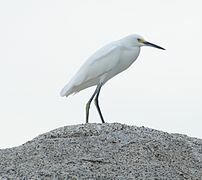 Look up snowy egret in Wiktionary, the free dictionary. "Snowy egret media". Internet Bird Collection. This page was last edited on 29 March 2019, at 05:45 (UTC).